Do You Have Something New? When I coached high school basketball, I would buy a new tie when district tournaments came along. Unfortunately, I didn't always get to wear it very long, as my teams were eliminated sooner than I would have liked. As a teacher, I often did the same thing--grabbing a new poster or something for the classroom at the start of the year. As a professor, I do the same thing most years. A few years ago it was a cactus for my office. I figured I could keep a cactus alive, even through my fifth floor window that might or might not have been washed since the first Clinton Administration. More recently, it was a chute of bamboo. Both are struggling today. 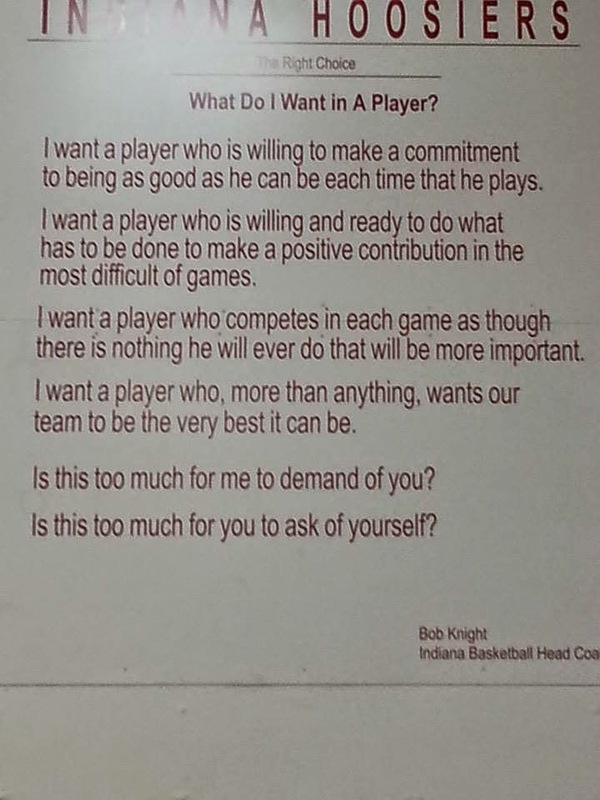 I'm not a huge Bob Knight fan, but I loved my first trip to Assembly Hall last winter and am a huge fan of this statement. Haven't seen much better.